Today’s General Meeting of Regeneration International, hosted at Navdanya’s Earth University saw people from all over the world coming together to examine strategies and solutions to scale up the regeneration movement. The event started with a tour of Navdanya Biodiversity conservation farm, Seed Bank and Earth University. Drona Chetri, coordinator of courses at the institute, explained how “the biggest agenda after the Green Revolution was to have high yielding crops, not for the local economy, not for the national economy, not even for the country, but to export more, so that India could be a ‘developed’ country too, to have more money. Just before the Green Revolution India had about 2 millions varieties of rice. The Green Revolution wiped out almost everything. Navdanya has been able to save about 5,000 varieties. Just in this Seed Bank at the farm we are saving 1,500 of them, of which 735 are actually been grown right here at the farm, right now. We have about 25 varieties of millets, we have different types of wheat which we are conserving, about 222 varieties. We also have 145 different seasonal vegetables varieties. When Navdanya had got this land it was under eucalyptus, which is not from India. What Navdanya did to actually work with the land and rejuvenate the land was to plant more varieties of trees so that the roots could grow and hold more water. In terms of rejuvenating the soil what Navdanya did was applying indigenous farming practices”. He also gave insights about Navdanya’s work at the Earth University: “What Navdanya did was to go to all those communities which were still doing farming without using chemicals, that is how we got the seeds at first. Than we started talking to all the grandmothers, this is actually grandmothers’ knowledge and in the last 25 years we have done a lot of experimenting. That is how we have learned. We have a training program for farmers. Navdanya farmers’ network has brought together or chained more than 5 million farmers across 22 states in India, of which at least 1 million is actually practicing organic farming in India. This 5 million represents about 20% of farmers of the country. We also have important international courses, like ‘Gandhi, globalization and Gross National Happiness (GNP)’ and A-Z on Biodiversity, Agroecology and Organic Food Systems. 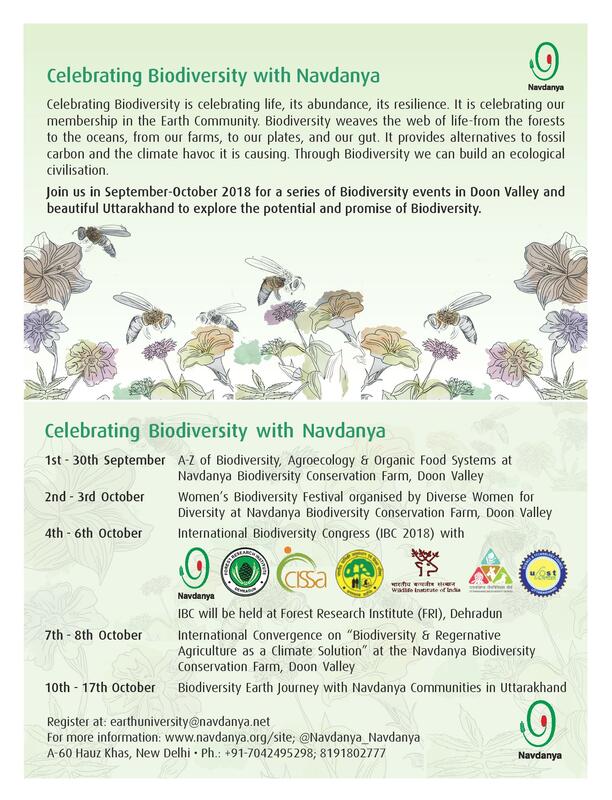 Navdanya is also organizing Earth Journeys in different regions across India to show the diversity that we have built in 30 year of work with farmers and communities”. Neha Raj Singh, programs coordinator, talked about the work with communities across India: “The main themes we work on are Seed, Food, Soil and Water, but our work is also based on the needs according to the different regions. For example in Jharkhand we work with movements on forests, because the main issue is on land rights there. That is where one the biggest movements was started the ‘Save the Forests Movement;. Jharkhand has to deal with land-grabs, mining and other issues threatening land rights. So it was first about protecting their land at first and then working with the land. The farmers we are working with are trying to transition to organic both for ecological and economic reasons”. Regeneration International’s mission is “to promote, facilitate and accelerate the global transition to regenerative food, farming and land management for the purpose of restoring climate stability, ending world hunger and rebuilding deteriorated social, ecological and economic systems”. It engages with a network of more than 250 international partners and a growing number of Regeneration Alliances throughout the world. Navdanya is part of the steering committee of Regeneration International, and has played a key role in the Regenerative Agriculture movement in clearly defining the central role of food systems in the issues of Climate change and climate justice; particularly, its analysis on how industrial agriculture per se can only keep exacerbating the climate crisis while biodiverse ecological agriculture has been shown to be a solution for climate adaptation, resilience and restoration. Thirty eight representatives from more than thirty organizations from Belize, Brazil, India, Kenya, Lesotho, Mexico, Mozambique, Myanmar, Nepal, Tanzania, United States, Zambia, and Zimbabwe met at Dr. Shiva’s Navdanya Farm to network and explore next steps for Regeneration International, a cooperative of stake holders committed to promoting small scale organic farming as a solution to climate change. Read Regenerational International Meeting’s Report. The indoors meeting was opened by Ronnie Cummins, founder and director of the Organic Consumers Association and co-founder of Regeneration International: “Regeneration International is about creating a ‘network of networks’, bringing together people who are working/living for a resilient world in different manners (farmers, decision/policy makers, consumers, restaurants, education centers). It is based on 4 main drivers: 1. basic education and public awareness 2. Farmers’ innovations and knowledge sharing 3. Policy Advocacy 4. Investments to connect people who can bring regeneration forward”. Christine Von Weizsacker, one of the founders of Diverse Women for Diversity warned the attendants about threats hidden behind new language used in modern agriculture: “Sequencing is merely the reproduction of what already exist and is needed, but by whom?! Big companies always behind with a financial interest. It is the opposite of natural evolution of biodiversity. Gene drives: new varieties with gene drivers will kill/cut out everything that is different from them and big data are used to administer gene sequences. Big data is ‘the new oil. Precision agriculture is basically farming without farmers and their knowledge, by stealing of their work to get total control over their livelihoods”. farm to evolve solutions to climate change. No Comments to "Inside Navdanya Farm – Regenerative Agriculture Gathering"